At a time when many people are feeling more stressed than ever. 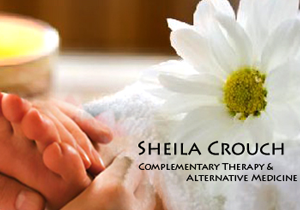 I offer a range of holistic therapies to help you relax and rejuvenate to improve your health and well being. Benefit from over 25 years professional experience. Please subscribe below to receive information of offers and events. A leading-edge holistic health practitioner and international trainer specialising in whole-self development and alternative health therapies based in Norfolk. Based in Norfolk, Sheila works throughout Norfolk, Twickenham, Middlesex, Surrey and the surrounding areas. An International Speaker and Workshop Leader and a qualified Teacher of therapies to professional standards. Member of NHS Primary Care Register for Reflexology a referral for GPs. Founder of Conscious Self Healing Process a unique life changing experience integrating the whole being leading to authenticity, happiness and success in all aspects of life. "I specialise in bringing clarity to the present problem; supporting you to develop the skills needed to regain control of your life and health". I work in partnership with you, to help you to take control on a physical, spiritual, mental and emotional level, leading to higher awareness of who you truly are and what you are capable of . You can expect to receive a professional, friendly and personal service from a fully trained and enthusiastic therapist. Sheila will endeavour to meet all your individual requests and is dedicated to providing excellent customer service. My expertise and experience in energetic, transpersonal and physical therapies allows me to work at all levels; discovering causative events and gently resolving conflicts and blocks. My holographic self healing approach releases trauma and diminishing habits from the whole being. Our conscious awareness is only the tip of the iceberg of the complex pre- and non-verbal /non-conscious information driving our beliefs, emotions and behaviours. By creating a common language between all levels of existence, I am able to aid you in creating a deep inner understanding and dialogue, which will allow you to be at one with yourself, relaxed and able to create your own SOULutions to be your authentic Self and manifest the life you want. I will work in partnership with you to release diminishing beliefs and patterns of behaviour, which can result in problems from physical disorders to poor relationships. A UNIQUE, PROFOUND, FAST AND GENTLE PROCESS FOR CHANGE AND HAPPINESS. For more information please contact Sheila Crouch today on 01362 289561. Whatever the Occasion - Gift Vouchers are available! Why not treat someone special today!